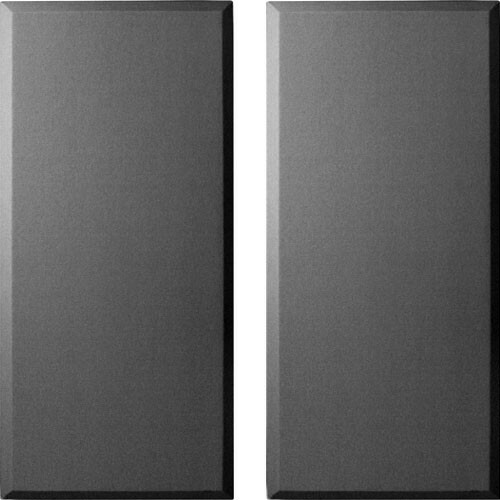 The F123-2448-00 3" Thick Broadway Panel Control Columns (Black) from Primacoustic is a set of high-density absorptive panels designed to provide an acoustic treatment where you want to control primary reflections, eliminate flutter echo, and reduce standing waves. A typical installation includes a series of these panels installed between the sound source and the listener, usually spread across a wall surface with space between each panel. This configuration allows energy to reflect back into the room to prevent deadening of the acoustic space and leaves a sense of balance and natural ambient acoustics. The panels are easy to install on virtually any surface and feature a roman-pillar column-shaped design that is sure to match the aesthetic look of any environment. Its tall rectangular design makes it particularly well suited for installation in live-end and dead-end spaces, such as studios and home theaters. However, spreading multiple panels across a larger space, such as practice rooms or studios, can also be an economical choice for a larger installation. This model is made from 6-pound-per-cubic-foot fiberglass and has a panel depth of 3". It also features beveled edges. The set includes (4) panels, which are sufficient for a total surface coverage of 32 square feet. Mounting the panels on Primacoustic's Offset Impalers can create a space between the panels and the mounting surface to further enhance the absorptive performance of this product. Use these panels to improve acoustics by controlling primary reflections, eliminating flutter echo, and reducing standing waves. The panels can be mounted to virtually any surface. This solution works equally well in small- or large-scale installations. Dimensions (HxWxD) Panel Dimension: 48 x 24 x 2"
Box Dimensions (LxWxH) 49.0 x 14.0 x 13.0"